In the past century, histories of the 1917 revolution have usually focused on Petrograd and Russian socialists. But the Russian empire was predominantly made up of non-Russians — and the upheavals in the imperial periphery were often just as explosive as in the center. The Finns were unlike any other nation under tsarist rule. Annexed from Sweden in 1809, Finland was allowed governmental autonomy, political freedom, and eventually even its own democratically elected parliament. Though the tsar attempted to limit this autonomy, political life in Helsinki resembled Berlin far more than Petrograd. In a period when socialists elsewhere in imperial Russia were obliged to organize in underground parties and were hunted down by secret police, the Finnish Social Democratic Party (SDP) operated openly and legally. Like German Social Democracy, the Finns from 1899 onwards built up a massive working-class party and a dense socialist culture with its own assembly halls, working women’s groups, choirs, and sports leagues. Politically, the Finnish workers’ movement was committed to a parliamentary-oriented strategy of patiently educating and organizing workers. Its politics were initially moderate: talk of revolution was rare and collaboration with liberals was common. But the SDP was unique among Europe’s mass legal socialist parties in that it became more militant in the years before World War I. Had Finland not been part of the tsarist empire, it is likely that the Finnish Social Democracy would have evolved down a similarly moderate path to most Western European socialist parties, in which radicals were increasingly marginalized by parliamentary integration and bureaucratization. We live in a wonderful period of time … Peoples who were humble and satisfied to bear the burden of slavery have suddenly thrown off their yoke. Groups who until now have been eating pine bark, now demand bread. In the wake of the 1905 Revolution, moderate socialist MPs, union leaders, and functionaries now found themselves a minority within the SDP. Seeking to implement the orientation elaborated by German Marxist theoretician Karl Kautsky, from 1906 onwards most of the party infused legal tactics and a parliamentary focus with a sharp class-struggle politics. “Class hatred is to be welcomed, as it is a virtue,” proclaimed one party publication. Only an independent labor movement, the SDP announced, could advance workers’ interests, defend and expand Finnish autonomy from Russia, and win full political democracy. A socialist revolution would eventually be the task of the day, but until then the party should cautiously build up its strength and avoid any premature clashes with the ruling class. This strategy of revolutionary social democracy — with its militant message and slow-but-steady methods — was spectacularly successful in Finland. By 1907, over one hundred thousand workers had joined the party, making it the largest socialist organization per capita in the world. And in July 1916 Finnish Social Democracy made history by becoming the first socialist party in any country to win a majority in parliament. Due to recent years of tsarist “Russification,” however, most state power in Finland by this time was held by the Russian administration. Only in 1917 did the SDP confront the challenges of holding a parliamentary socialist majority in a capitalist society. In the morning soldiers and sailors marched with red banners on the streets, partly in processions singing the Marsellaise, partly in separate crowds, giving out red ribbons and pieces of cloth. Patrols of armed rank-and-file bluejackets roamed everywhere round the city disarming all officers, who when giving the slightest resistance or refusing to take the red token were gunned down and left lying there. It was the express policy of the [Finnish SDP] to destroy the police entirely. The police force, which had been ousted by the Russian soldiers at the very beginning of the revolution, never came into being again. The “people” felt no confidence in this institution, and in its stead local corps for the maintenance of order were established a “militia,” the men of which were to belong to the Labour Party. What should replace the old local Russian administration? Some radicals pushed for a Red Government, but they were in a minority. Like in the rest of the empire, Finland in March was swept up by a call for “national unity.” Hoping to win broad autonomy from the new Russian Provisional Government, a wing of moderate SDP leaders broke with the party’s longstanding position and joined a coalition administration with Finnish liberals. Various radical socialists denounced this move as a “betrayal” and a gross violation of the SDP’s Marxist principles — other key leaders, however, went along with the entry into government in order to prevent a split in the party. The proletariat no longer begged and prayed, but claimed and demanded. Never, I suppose, has the working-man, but especially the rough, felt so puffed up with power as in the year 1917 in Finland. Pure mob-rule developed with unexpected swiftness. … First and foremost the tactics of the Labour Party [were to blame]. … Even if the Labour Party thus observed a certain dignity in its most official conduct, it still continued its agitation policy against the bourgeoisie with unwearied zeal. While moderate socialists in the new government, as well as their labor leader allies, sought to dampen the popular insurgency, the far left of the party consistently called for a break with the bourgeoisie. Wavering between these socialist poles stood an amorphous centrist current which gave limited support to the new administration. And though most SDP leaders generally continued to prioritize the parliamentary arena, the majority supported — or at least went along with — the surge from below. The implosion of the Finnish coalition government began in the summertime. By August, the empire’s food supply had collapsed and the specter of starvation gripped Finnish workers. Food riots broke out early in the month and the SDP’s Helsinki organization denounced the government’s refusal to take decisive measures to address the crisis. “The hungry working masses soon lost all confidence in the coalition government,” noted Otto Kuusinen, the main left theoretician of the SDP, who went on to found the Finnish Communist movement the following year. Socialist intransigence in the struggle for national liberation further escalated class polarization. Finnish socialists fought hard to end the ongoing interference of the Russian government in their nation’s internal life. By winning independence they hoped to use their parliamentary majority — and their control of the workers’ militias — to push through an ambitious program of political and social reforms. Finland’s conservatives and liberals for their own reasons also wanted to strengthen Finnish autonomy. But they were not willing to turn to revolutionary methods to achieve this goal — nor did they generally support the SDP’s push for full independence. The clash finally came in July. In the Finnish parliament the socialist majority proposed the landmark valtalaki (Power Law) bill which unilaterally proclaimed full Finnish sovereignty. Sharply opposed by the conservative parliamentary minority, the valtalaki was approved on July 18. But the Russian Provisional Government, led by Alexander Kerensky, immediately rejected the validity of the valtalaki and threatened to occupy Finland if its verdict was not respected. When Finnish socialists refused to back down or renounce the valtalaki, Finland’s liberals and conservatives seized the moment. Hoping to isolate the SDP and put an end to its parliamentary majority, they cynically supported and legitimized Kerensky’s decision to dissolve the democratically elected Finnish parliament. New elections to parliament were called, in which non-socialists narrowly won a majority. our bourgeoisie had no army, nor even a police force they could count upon … [t]herefore there seemed every reason to keep to the beaten track of parliamentary legality, in which, so it appeared, Social Democracy could wrest one victory after another. But it was becoming apparent to an increasing number of workers and party leaders that the parliament had outlived its usefulness. Socialists denounced the antidemocratic coup and lambasted the bourgeoisie for colluding with the Russian state against Finland’s national rights and democratic institutions. According to the SDP, the new parliamentary election was illegal and had been won through widespread electoral fraud. In mid-August the party ordered all its members to resign from the government. No less significantly, Finnish socialists increasingly allied themselves with the Bolsheviks, the only Russian party to support their push for independence. All sides had thrown down the gauntlet and hitherto peaceful Finland hurtled towards a revolutionary explosion. We cannot avoid the revolution for very long … Faith in the value of peaceful activity is lost and the working class is beginning to trust only in its own strength … If we are mistaken about the rapid approach of revolution, I would be delighted. After the Bolsheviks won power in late October, it seemed that Finland would be next in line. Deprived of the military support of the Russian Provisional Government, Finland’s elite was dangerously isolated. Russian soldiers — stationed in Finland by the tens of thousands — generally supported the Bolsheviks and their call for peace. “The wave of victorious Bolshevism will give our socialists water under their mill, and they are certainly able to start it turning,” observed one Finnish liberal. The SDP ranks and the Bolsheviks in Petrograd implored Finnish socialist leaders to immediately take power. But the party leadership prevaricated. It was unclear to anybody whether the Bolshevik government could last more than a few days. Moderate socialists clung to the hope that a peaceful parliamentary solution could be found. Some radicals argued that the seizure of power was both possible and urgently necessary. Most leaders wavered between these two options. Unable to come to an agreement on an armed uprising, the party instead called a general strike on November 14 in defense of democracy against the bourgeoisie, for workers’ urgent economic needs, and for Finnish sovereignty. The response from below was overwhelming — in fact it went much further than the relatively cautious strike appeal. Finland ground to a halt. In various towns, local SDP organizations and Red Guards took power, occupied the strategic buildings, and arrested the bourgeois politicians. It seemed that this insurrectionary pattern would soon be repeated in Helsinki. On November 16 the General Strike Council in the capital voted to seize power. But when moderate union and socialist leaders denounced the decision and resigned from the body, the council retreated that very day. It resolved that “since so large a minority dissented the Council cannot on this occasion begin taking power into the hands of the workers, but will continue to act to increase pressure on the bourgeoisie.” The strike was soon after called off. There can be little doubt that this was the best moment for the workers’ organizations to seize power. The pressure from below was enormous, and the will to fight was at its greatest … The general strike convinced the bourgeoisie, with few exceptions, however, of the acute danger of the socialists. They used the time until the outbreak of the open civil war to organize themselves under a firm leadership. 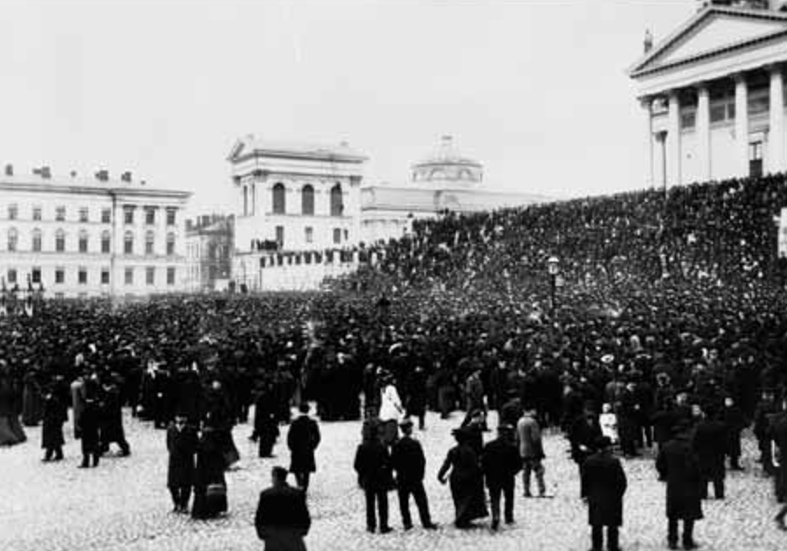 Noting the SDP’s hesitancy to turn to mass action, Anthony Upton has argued that “the Finnish revolutionaries were in general the most miserable revolutionaries in history.” Such a claim might hold water were our story to end in November — but subsequent events showed that the revolutionary heart of Finland’s Social Democracy eventually prevailed. After the general strike, frustrated workers increasingly looked for arms and turned to direct action. The bourgeoisie similarly prepared for civil war by building up its “White Guard” militia and turning to the German government for military support. Despite the rapid breakdown of social cohesion, many socialist leaders continued to engage in fruitless parliamentary negotiations. Yet this time the SDP left wing stiffened its spine and declared that any further delay in revolutionary action would only lead to disaster. Through a long series of internal battles in December and early January, the radicals eventually won out. In January the SDP’s revolutionary words were finally translated into deeds. To signal the start of the insurrection, party leaders on the evening of January 26 lit a red lantern in the tower of the Helsinki Workers’ Hall. Over the next days, the Social Democrats and their affiliated workers’ organizations rather easily seized power in all the large cities of Finland — the rural north, in contrast, remained in the hands of the upper class. The revolutionary power in Finland from this point on belongs to the working class and its organizations. … The proletarian revolution is noble and severe … severe for the insolent enemies of the people, but ready to give its aid to the oppressed and marginalized. Though the newly established Red Government attempted at first to chart a relatively cautious political course, Finland quickly descended into bloody civil war. The delay in seizing power had cost the Finnish working class dearly since by January most Russian troops had returned home. The bourgeoisie took advantage of the three months after the November strike to build up its troops in Finland and Germany. Ultimately, over twenty-seven thousand Finnish Reds lost their lives in the war. And after the right wing crushed the Finnish Socialist Workers’ Republic in April 1918, another eighty thousand workers and socialists were thrown into concentration camps. German imperialism gave ear to the lamentations of our bourgeois, and gave itself out as ready to swallow up the newly acquired independence, which, at the request of the Finnish Social Democrats, had been granted to Finland by the Soviet Republic of Russia. The national sentiment of the bourgeoisie did not suffer in the least on this account, and the yoke of a foreign imperialism had no terrors for them when it seemed that their “fatherland” was on the point of becoming the fatherland of the workers. They were willing to sacrifice the entire people to the great German bandit provided that they could keep for themselves the dishonorable position of slave drivers. What should we make of the Finnish Revolution? Most obviously, it shows that workers’ revolution was not solely a phenomenon in central Russia. Even in peaceful, parliamentary Finland, working people became increasingly convinced that only a socialist government could offer a way out of social crisis and national oppression. Nor were the Bolsheviks the sole party in the empire capable of leading workers to power. In many ways the experience of the Finnish SDP confirms the traditional view of revolution espoused by Karl Kautsky: through patient class-conscious organization and education, socialists won a majority in parliament, leading the Right to dissolve the institution, which in turn sparked a socialist-led revolution. The party’s preference for a defensive parliamentary strategy did not ultimately prevent it from overthrowing capitalist rule and taking steps towards socialism. In contrast, the bureaucratized German Social Democracy — which had long since abandoned Kautsky’s strategy — actively upheld capitalist rule in 1918–19 and violently smashed efforts to overturn it. Yet Finland showed not only the strengths but also the potential limitations of revolutionary social democracy: a hesitancy to abandon the parliamentary arena; an underestimation of mass action; and a tendency to bend to moderate socialists for the sake of party unity.